Meanwhile, in a bowl, combine the blue cheese and butter; set aside. In a skillet, saute bread cubes in oil until golden brown. Sprinkle with Parmesan cheese. 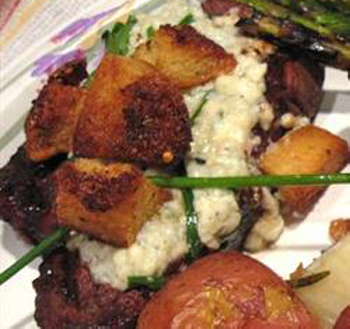 Top steaks with blue cheese mixture and sprinkle with croutons; broil 1 minute longer or until cheese is slightly melted.